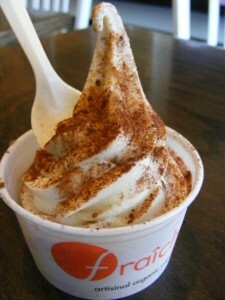 A soy frozen yogurt from Fraiche in Palo Alto, CA. I topped it with cinnamon and cocoa powder (free!). I wandered around while I ate it and drank cold ice water. I stopped by Lululemon (a few good sales, but nothing in my size) and followed it up with a manicure. My nail/wax person, Tina, asked me if I use self-tanner on my hands. Guess the kabocha is finally kicking in. I told her about it and she said that it must be good for my skin because my face looks great. Tina also told me about “nghe” (she didn’t know the English word for it; she’s Vietnamese. What looks like ginger on the outside but is bright yellow on the inside? Turmeric! I googled around and found out that nghe is Vietnamese for turmeric. You can make a paste from the rhizome and put it on your face and apparently it’s great for the skin. She said it’s also good if you eat it… and she says it won’t turn your skin yellow. I think I might try it if I can find it around here. 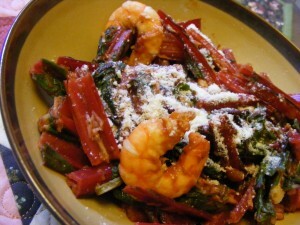 Last night I decided to use more pantry items for dinner and made a shrimp/greens/spaghetti sauce meal. I sauteed a whole lotta garlic in a whole lotta olive oil (healthy fats), added shrimp, added greens, added sauce + water, and topped with lots of vegan parm (which is nowhere near as good as real parmesan). 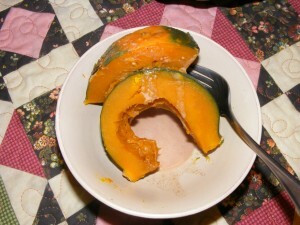 And I only ate half of a kabocha last night. 😀 Coco‘s trying to cut back on kabocha as well. I think it’s good to have things in moderation. 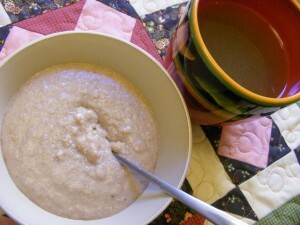 This morning I did what I did yesterday… ABU oat bran + miso soup. I missed my miso! I wanted to do something new for breakfast since I wasn’t in the mood for green oats. 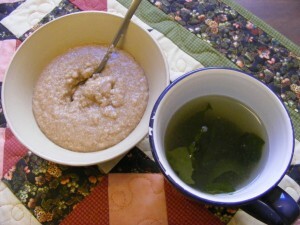 I decided to go all macrobiotic and do an oat bran + miso soup brekkie. I try to make a big pitcher of tea every morning and drink it throughout the day. It was really good as a miso soup base. 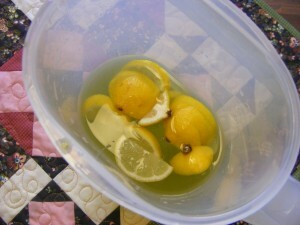 I especially liked the hint of lemon (I slice a whole lemon and dump it into the tea). 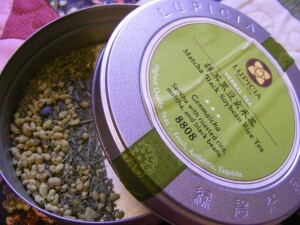 I get the tea from Lupicia – I have a ton of different flavors and I’m trying to use them up so I can get new ones. This is “Matcha Black Soybean Rice Tea“. One of my (and Bobby’s!) favorites. This breakfast was surprisingly filling, since the green oat bowls are actually bigger than what I made today (spinach gives it volume). Don’t forget about my June challenges. I’ll be updating about them either tomorrow or on the first of July. I have to admit, I kind of forgot about most of them. I was supposed to declutter and give away one thing every day, but I think I only have 2 things in my declutter box. 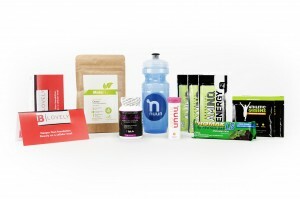 I suppose I can find 30 things to give away tomorrow though. Do you have any challenges that you want to work on? But I had no idea what to do with it. It sat in my fridge all week until yesterday when I decided to try adding chard to my oat bran (instead of just spinach). 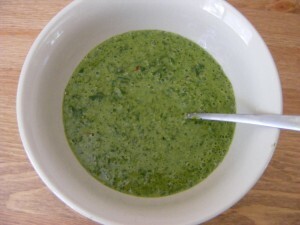 I used half chard greens, half spinach. 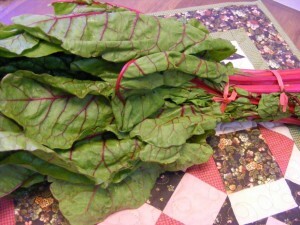 It had a few pretty red specks from the red chard! Surprisingly good. I could definitely taste the chard more than I can normally taste the spinach, but I liked it. I don’t think this would be a good choice for someone new to green oats though – too intense. Instead of my usual peanut/almond butter, I used ABU (3-4 tablespoons?). I loved how the ABU blended so smoothly into the oat bran. 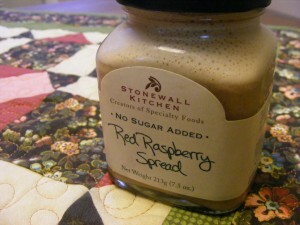 Sometimes with nut butters I get lumps, even after blending – I prefer no lumps of nut butter so this was great. Can’t forget those vegan bacon bits. I’m actually all out and need to get more very soon. I decided to make my own honey mustard dressing (since I love Annie’s lite honey mustard so much) but it’s still a work in progress. I forget which dressing went on this salad. 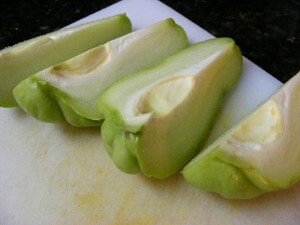 I decided to keep it simple with my chayote since I’d never had it before. I chopped it in quarters and discovered a soft, pit-like thing. I discarded it. I probably could have kept it… but I didn’t know? What do you do? Then I chopped it in pieces. And I sauteed it with sesame oil, grated organic garlic, and chili powder. 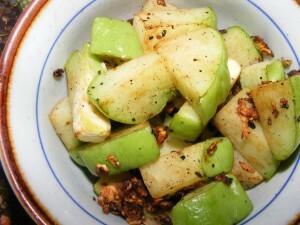 First I heated the oil and added the garlic to let it get crispy, then I added the chayote and chili. I used a cast-iron skillet (Wagner Ware, really old, from my Grandma) which is my new obsession. It was good. It didn’t really taste like much besides garlic and chili powder (which I do love). I think it tends to take on the flavors of whatever you cook it with. I would definitely get it again, but it’s nothing terribly special. It’s cheap too, which is always good. I think it was about $0.79/pound, but I don’t remember exactly. 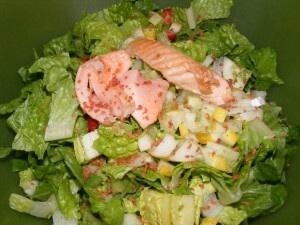 While I was cooking I snacked on a few pieces raw, and they were good too – nice and refreshingly crunchy. I think it would be good on a salad. Sounds good to me! Will you try it? I got mine at the Asian market but they’re also in Whole Foods, Mexican/Latino markets, and sometimes even regular grocery stores. The most recent blog fad seems to be… PBU. So I made ABU, with almond butter and chocolate soy milk. I have a container of chocolate soy milk that I need to use (I don’t drink milk, soy milk, or any milk really… I don’t really eat much cereal and I haven’t been baking) so I decided to use that for this good cause. 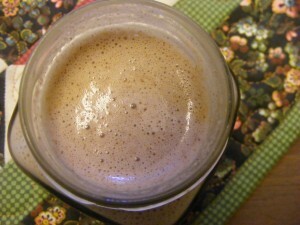 I changed it a little – 1 part almond butter to 3 parts milk – to make it more saucey and less creamy. I blended it in my mini food processor. You must try it. It cheered me up. I am sad because Bobby is in Miami for the weekend and I miss him. He’s spending quality time with his family though, and I’m happy about that. The other day when I was feeling glum (Tuesday), I did something else to get happy. 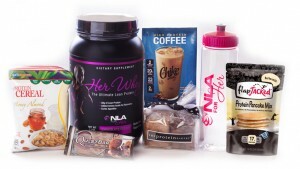 I have lots of yummy plans for today – yoga, reading, maybe an errand or two, and whatever else comes my way. What are your weekend plans? I think I want to check out a new yoga class, and I’m teaching on Sunday. P.S. 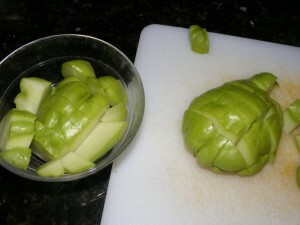 I made chayote! I’ll post about it soon. It was good. P.P.S. Coco tried doing a yoga flow on her own and SHE LOVED IT! She also tried apple cider vinegar. What are you waiting for?